At six o’clock on the morning of May 1, 1864, the 96th Pennsylvania awoke to the sound of bugle calls. Following reveille, the tune of a march played. For the first time since December, the 96th and the rest of the First Division of the Union’s VI Corps were to take to the roads. The long-awaited opening of General U.S. Grant’s campaign into Virginia was getting under way. The winter of 1863-64 was a cold one in Central Virginia. While the corps headquarters quartered themselves in the spacious estate of Dr. William Wellford nearby, the enlisted men tried to stay warm in the hastily designed and built shelters. Crafted from nearby supplies of wood, stone, and mud, these cabin-like structures became home for the chilly winter months. By the end of April, however, most men were back in the ranks and reenlisted in the Union cause. When the plans for marching came down at the end of the month, the men of the 96th stood ready to cross the river and do battle once more. 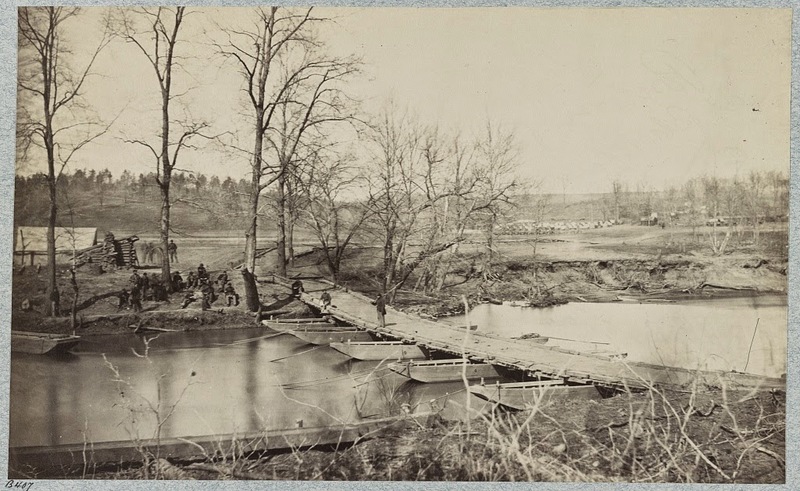 After being rousted from their beds at 6 a.m., the men of Company G set out with the regiment and the division as they crossed the pontoon bridge set up across Hazel River at Wellford’s Ford. Among the last to cross the bridge, the regiment were stopped a short distance from the river and ordered again to make camp. 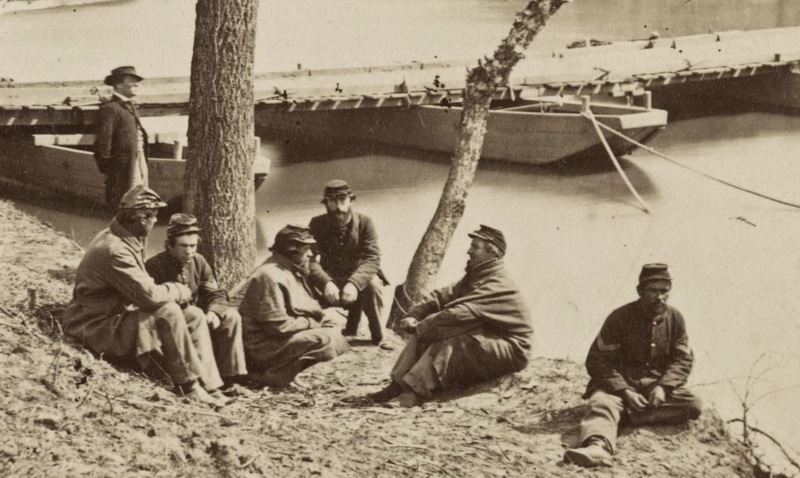 Their brief march served only to allow the engineers to tear up the pontoon bridge and move it farther ahead where it was needed for the coming campaign. Here, only a mile from their winter quarters, the VI Corps set up temporary camp in a rainstorm while it waited for orders to cross the Rapidan River into enemy territory. Corporal Henry Keiser’s entry for Sunday, May 1, 1864. At six this morning we were routed up and had orders to march. 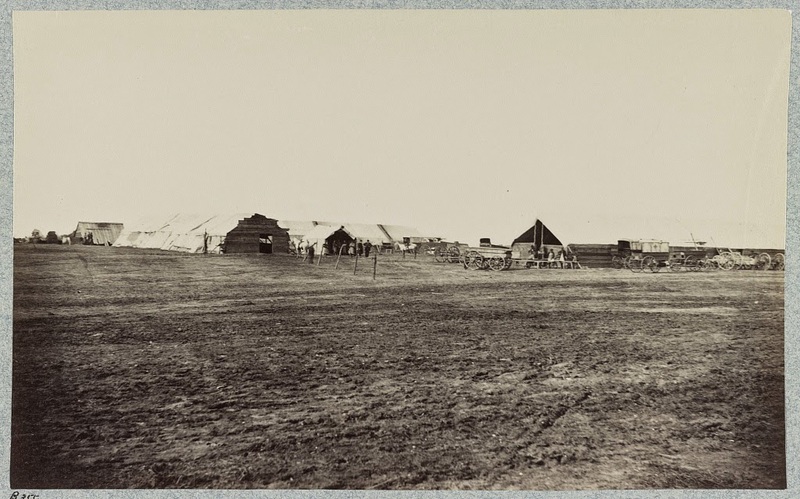 At seven we left Camp and only marched one mile across Hazel River, where we went into camp. We were merely brought across the river to allow the pontoon bridge to be taken up. Received a paper from father. It was fine all day until this evening, when we had a heavy shower. 1. Bates, Samuel P. History of Pennsylvania Volunteers: 1861-65; Volume III. (Harrisburg: State Printer, 1870.) 388. 2. Clark B. Hall. ““Wellford’s Ford: The most significant military crossing on the Hazel River.” Brandy Station Foundation. Web. Accessed 21 April 2014. 3. Henry Keiser Diary: Veteran Furlough lasted for 30 days. However, several men in the regiment, including Keiser were allowed to stay for a few extra weeks before returning to the front. February 22 – April 15.